Welcome to the Hillel JUC family! From chicken soup deliveries to Holiday celebrations, weekly Shabbat Dinners, Israel experiences, social justice programs, leadership development opportunities, and just a place to meet new friends, the Hillel Jewish University Center of Pittsburgh (Hillel JUC) is at the heart of what makes being a college student in Pittsburgh so unique! We are here to ensure that every Jewish student feels connected and supported during this exciting and challenging time in their lives. Last school year more than 1,000 students participated in our programs and activities. We’re fortunate to have a thriving and diverse Jewish community on campus. We want to be sure that your student knows about all of the ways to become involved. Let us know they will be on campus here. 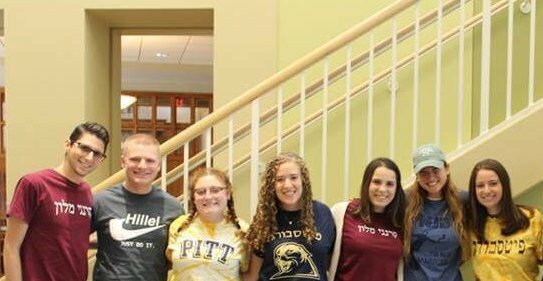 We hope you will take a moment to also join our closed Facebook group, Hillel JUC Parents, which will help you connect with other families interested in enriching the lives of their Jewish students while at school in Pittsburgh. Follow us on social media @HillelJUC. Visiting on a Friday? Please join us for Shabbat dinner by filling out this form. We look forward to getting to know you and your student! P.S. Check out the Forward’s first-ever college guide where Pitt and CMU came in at #38 and #40 respectively!